The advantage in India is its talent. Lots of these large companies, whether it is GE or Microsoft, have R&D centers here. All the big banks and corporations have set up their back offices. Why? Because talent is available. 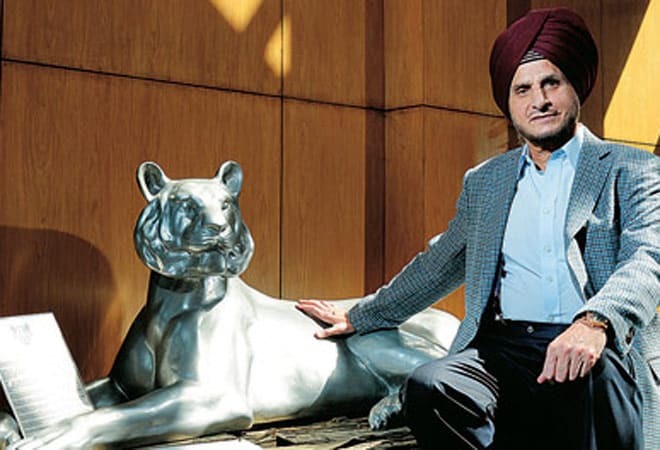 Onkar Kanwar, Chairman and Managing Director of Apollo Tyres. Q. Explain the relevance of 'Make In India' given the current manufacturing scenario in the country. A. As far as Make In India is concerned, it is a very good, laudable objective. Real employment comes from manufacturing. Unfortunately, for the last 10 years, there has been a lot of talk, but no action on the ground. The result is we have been stuck at 15 per cent (of GDP) whereas China is far higher. The advantage in India is its talent. Lots of these large companies, whether it is GE or Microsoft, have R&D centers here. All the big banks and corporations have set up their back offices. Why? Because talent is available. People want to see how they can give their best. They want to work hard. But every year we are creating 10 million youngsters who are looking for job opportunities. Now unless and until we create an environment where they have employment opportunities, we will not be able to take manufacturing forward beyond 15 per cent. The last figure which we targeted was 25 per cent (of GDP). But hopefully with Modi coming in, at least we have a stable government. So we will have stable policies. It is a matter of months; we cannot expect miracles to happen. But the challenge for us is the infrastructure. Land is becoming a big challenge. These things are to be addressed seriously. There are lot of issues involved between the state and the Centre. From talks I find that Modi wants to move and strike hard. And personally, I think, decision making will become faster. Q. What decisions, for example? A. He (Modi) has said to his ministers and juniors to take decision as they like. In case of a problem, they can go to Modi. Very rarely we have a prime minister who could say these things. And luckily he has got a strong government. So that will help. But if you ask me, he has very limited time right now. Very difficult to say, but his intentions and actions speak louder than what people think of him. And personally, I am very bullish. Q. Let us talk about your company. Do you also have excess capacity now? A. No, we have a shortage of capacity because we are not only depending on India. Today, we are the only company exporting passenger car radial tyres to Europe. No other company can claim this, among the Indian tyre companies. A. We are in the process of setting up a new factory. We have just got the clearance. Q. But was that a compulsion to put up a plant in Europe? A. We don't go by compulsions. We go by economic viability, and we find this a most challenging and advanced market as far as Europe is concerned. And if make the right kind of product, we can make an entry in the market, you make more returns. Q. My point is why did you not think of another factory in India? A. We have enough capacity as far as India is concerned. Q. But you are exporting anyway. A. Yes, but this freight only adds to the cost. Factories are good near the market. You cannot put up a factory away from the market. You can only export certain quantities. You can only export 20 per cent. That is not viable. You cannot set up a unit on a 100 per cent export. Q. It had nothing to do with availability of land in India, the power situation? A. Right now, we have not been looking at that at all. We don't have any problems. In most of the states where we are, we don't have any problems. Q. From your experience, how much time does it take to set up a factory in India - from identification of land to the factory up and running? A. In the past, it has not taken much time, to be honest. We've been very fast and we've identified the land within no time, I would say we put up the factory within 15 months to two years. Q. Fifteen months to two years? A. From the day we identified the land, both in Chennai as well as in Gujarat. Today, it's a big challenge. First of all, we don't know where can we get the land. Number two, the land has become very, very expensive and exorbitant. For putting up a factory, you cannot compare the cost of land vis-Ã -vis for the developer. A person who is developing for opportunities or for housing, his returns are quite different than the factory, which has a long term gestation period. We are trying to create employment... So the cost of land has become very expensive. You know where we used to pay Rs 10 lakh an acre, today the same land is available for Rs 1 crore. Q. Which area are you talking about? A. Well, we've looked at Chennai. A number of my people are looking around. They say depending on the place, the price is going from Rs 50 lakh-70 lakh to a crore. I told them I am not interested. We are going to Hungary. We have selected a piece of land, and the government is giving us â‚¬100 million for our investment.